Once a month a gallery and performance venue in the next town from us hold an event called Tales for Tots. It was three years after becoming a parent that I first heard of it, and four before I plucked up the courage to go along. 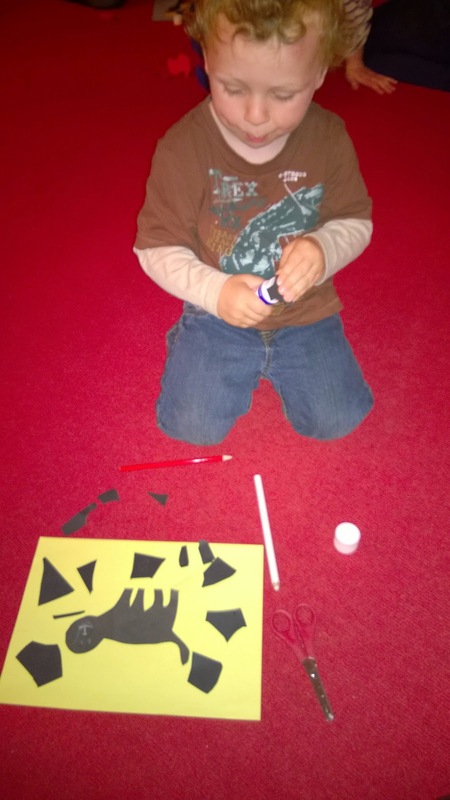 This sounds silly, but even for someone pretty outgoing like me I find going to new groups in unfamiliar venues quite daunting, and with a couple of little lads who prefer charging around to sitting still I was afraid we wouldn't fit in at all. Eventually we did try it out, and the kids did charge around and try to climb on the storyteller to my constant embarrassment of retrieving them and trying to get them to sit still. The storyteller was lovely, it was a good story, and had lots of fun craft activities mixed in to break up the time, plus singing, but it wasn't quite right for us at that time and I was a bit disheartened. Never one to quit at the first hurdle, I took the boys along again. This time a different storyteller and a different room. The boys still wanted to charge around, but this time the storyteller spent most of her time on her feet directing the energy of the small kids into useful actions and I had a much less stressful experience. This gave us the courage to try other storytelling events at other venues, mainly galleries, and I've found that each time the kids get more into the swing of things. The big difference with the last one we went to this Monday was that by now we felt like old friends of the storyteller that day, Ed Boxall, and now that Toby can hear he sat at the front with rapt attention as Ed wove his tale with the assistance of his amazing self-crafted shadow and light book. After the story we had a chance to make our own shadow pictures, and then finished with a big dance around. Hard as that first session felt, it is worth it all now because the tradition of storytelling is such a fantastic one to pass on to our children. Not just reading from a book, but an theoral tradition of using voice, gestures, rhythm and song to draw you in to a tale in a way that would have seemed very familiar to our ancestors. This exposure to professional storytellers seems to me to be a wonderful way to help children to build their vocabulary and language skills, as well as awaken their own imaginations. After the storytelling, we enjoy looking at whatever the latest exhibit is and often the boys will pick a particular picture they would like to try at home. On Monday the inspiration was a colossal wall sized painting. 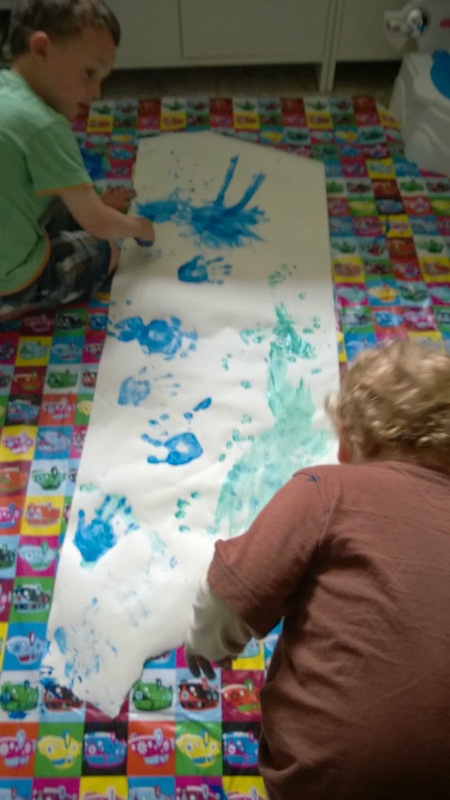 Ollie wanted to go straight home and paint something big, so off we went, rolled out the lining paper and got busy with feet and hands and brushes. Art galleries can seem like a crazy place to take small kids, with the panic of what they're going to knock into or touch with sticky hands, but generally so long as you do your best to keep them from causing too much chaos they welcome children. 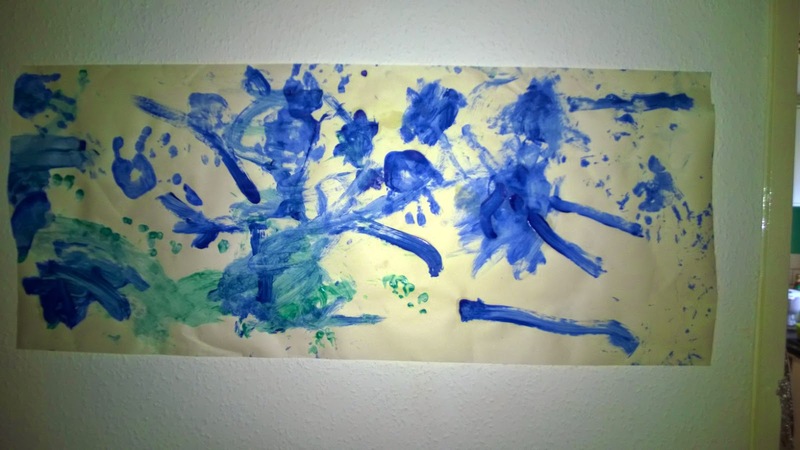 For their part, the kids attention spans may be quite short and they are unlikely to want to hear any deep exploration of the themes of the painting, but a charge around enjoying the colours and the odd description of what their favourite piece was and why is really fun.